As promised, here is the second set of Christmas Dot Painting worksheets. We love dot painting at our house and I know so many of you love it in your homes and classrooms too. I love how quickly you can set your kids up with these dot painting worksheets. There’s minimal prep required to get started. I made two different sets of Christmas Dot Painting worksheets. This is the second set. In case you missed the first set you can find them here. This Christmas Dot Painting set includes eight black and white worksheets: ornament, star, wreath, gift, Christmas tree, candy cane, bell, and Santa. The first set of Christmas Dot Painting includes eight black and white worksheets: stocking, gingerbread man, reindeer, Christmas light, bow, holly, Santa’s hat, elf. Download and print these Christmas dot painting worksheets on regular 8 1/2 x 11″ paper. We use Do A Dot Art! Markers for dot painting. If you don’t have Do a Dot Markers, you could also use Bingo Markers or Pom-Poms. Use a clothespin and squeeze a pom pom for a DIY pom pom dot maker. I also had a reader on the fall dot painting worksheets suggest filling in the dots with round stickers. I loved this suggestion! It’s makes these worksheets more portable and useful for times when you need a quiet activity to keep kids busy like doctor appointments and dining out. I talk about the benefits every time I make new dot painting worksheets. They really are great for you and your kids or students! Besides being mess free, dot painting also helps kids develop hand-eye coordination as they direct their marker to the spot on their paper. Kids strengthen fine motor skills as they hold the dot markers and move their hands to apply the marker to the paper. We have had our Do a Dot Markers for a few years and they still work great! We love hearing and seeing how much you are enjoying our dot painting worksheets, tag us in your photos on Instagram, Twitter, and Facebook. Thank you for the dot paint printables. I use them as a math activity. for addition,children take turns rolling a die and add the correlating number of loose parts to the dot printable. The child who fills in their circles first wins. for subtraction, start out will all the circles filled and subtract (remove) the correlating number of loose parts. The children love it!!!! What a great idea Mary! I love hearing about how many fun and different ways these printable can be used! Thank you a much Kim. I will be using them this week with the students. I hope your students enjoyed them Shirley! Thanks for sharing these worksheets! I am an Occupational Therapist and use them with my students for fine-motor development. I print them off a little smaller and have them colour in the circles with markers. Any chance of creating more generic winter themed images? This way I can use them with students of all religions. I’m so happy to hear how you are using these. I do plan on creating a winter set son. Hi- I can’t seem to download Christmas dot art pages. I’m sorry to hear that Mary. Here are a couple of things you might want to try: make sure you are downloading using a computer (rather than a phone), try a different browser (Google Chrome seems to work best), make sure you have the most current version of Adobe Reader installed. Please let me know if those options do not solve the issue for you. I cannot get the 2nd set to print either. The first set with the lightbulb , ginger bread man printed perfectly. I’m so sorry you had trouble Martha. I just tested it and it seemed to work okay. If you click the pink text next to download it should open it for you, so you can print or download. 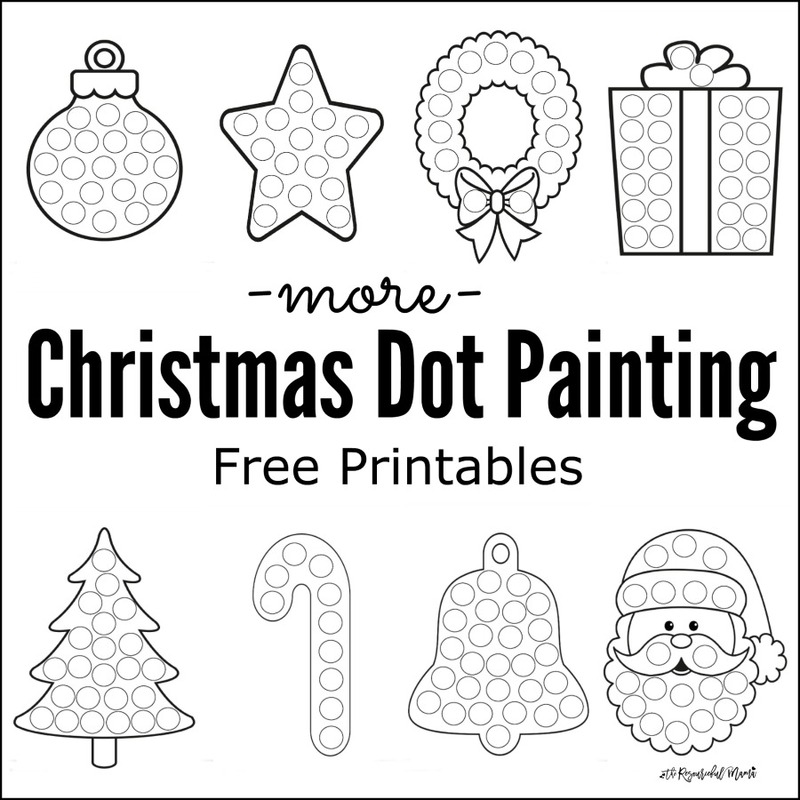 This is what you are looking for: Download: Christmas Dot Painting Worksheets. It’s towards the bottom. Hope that is helpful! Thank you I appreciate anything that i am able to get on your website. HAPPY Holidays!! Thank you Alma! Happy Holidays! I love all your dot art themes. I have downloaded and printed all the holidays to date. Our preschool class loves them and these are definitely the cutest ones I have seen plus I like how you actually have the dots there for them to dab rather than just an image. Everything on your website is so cute. You do a great job! Thank you so much! Thank you so much for your kind words Sue! I’m so glad your preschool enjoys them! Thank you so much for providing these! ! Using with special needs kids rollong play dough into balls and sticking them onto the circles of laminated pages. Blessings to you for sharing! Thank you for the sweet comment Melissa! You made my day! I’m so glad that these worksheets will be helpful in your sessions. We have them for all the seasons and holidays.